The prisoner, Abdel Malik Ahmed Abdel Wahab Al Rahabi, was one of the first to arrive at the facility when it opened in January 2002. He was never charged with a crime, but U.S. officials suspected he was one of Osama bin Laden’s body guards, according to leaked prison documents. Mid-Atlantic and North Eastern states are digging out from the snow, while the Southern Hemisphere enjoys its summer. Just as they do every year. The creditors blamed the utility, the Puerto Rico Electric Power Authority, or Prepa, for the collapse of the talks, saying its officials had decided to let an expiration date pass without taking action. Prepa is one of the largest single issuers of Puerto Rico’s $72 billion debt, most of it in the form of municipal bonds. Fears of Venezuela Default Grow Amid Oil Plunge. The plunge in the price of oil is causing more investors to bet that Venezuela will default on its $120 billion pile of foreign debt, an event that would trigger a messy battle over the country’s oil shipments and deepen its economic and political crisis. El Chapo got busted for the third time. Sean Penn got the interview, though. UPDATE: It was a movie deal disguised as an interview. El Chapo’s now in the same jail as he dug the tunnel from last year when he escaped. What could possibly go wrong? Squeezing the poor: Bus-Fare Protests in Brazil Turn Violent. Seventeen people were arrested in São Paulo as protesters rioted against an 8-cent increase in bus and subway fares. Brazil Inflation Reaches Highest Level in 13 Years. Consumer price inflation in Brazil increased last year to the highest rate in 13 years, underscoring one of the main challenges facing Latin America’s largest economy. Rio planned Olympic-scale sewerage project. But citizens say no thanks. Rio’s mayor says that the network is an Olympic legacy. So why have so few people connected to it? Is Colombia Really Safe? A Firsthand Look. TRENACO SA: unknown Swiss outfit bags $20bn contract from PDVSA. Read the article to find out why Ecuador. Search on for ‘City of the Monkey God’. The President of Honduras, Juan Orlando Hernandez, says scientists plan to explore a jungle site where they believe a mysterious ancient city is hidden. A new UCLA study shows that Guzman’s drug war has taken so many lives that it’s reduced Mexican lifespan expectations by six months, with the worst declines in the states where Guzman operates. Yet a Facebook commenter said that Mexicans consider the news as a way for Peña Nieto to create a distraction from the poor economy. Puerto Rico Defaults on $37 Million in Debt. The lawsuit filed late Thursday by Assured Guaranty Corp. and Ambac Assurance Corporation claims the government violated the U.S. constitution by diverting tax revenues meant to back certain bonds and used them instead to finance general obligation bonds, which have higher priority. I fully expect the Obama administration to close not only the prison but also the U.S. base at Guantanamo, after which, Obama will do a turnkey ceremony in Havana with photo-op with Raul Castro. The House version of the fiscal defense authorization bill, now in House-Senate conference, contains language that prohibits transferring any Guantanamo detainees abroad or to the United States. The bill does so by barring the Pentagon from spending any funds on the transfers or constructing or modifying prison facilities in the United States. It also bans putting the detainees in any Pentagon facilities worldwide or to combat zones. Lastly, the House bill prohibits using any defense funds to send terrorists from Guantanamo to any foreign country unless the defense secretary provides a certification that past transferees haven’t returned to terrorist activities. Although the bill fully funds the president’s budget request, Mr. Obama has threatened a veto on the grounds that it misuses the Overseas Contingency Operations to fund other defense programs. His real rationale for a veto, however, may be the House’s Guantanamo restrictions. No similar restrictions are in the Senate version of the bill. However, the House bill notes that the White House ignored previous legal restrictions on Guantanamo prisoners, thus bolstering the argument for keeping the more restrictive House language. As Drudge says, developing . . .
A White House spokesman says the administration is in the “final stages” of drafting its latest plan to close the prison holding terrorism detainees at Guantánamo Bay, Cuba. Press secretary Josh Earnest says closing Guantánamo remains a priority. Earnest said Wednesday it’s a waste to spend more than $100 million per year on a prison holding only 116 detainees. Earnest ignores any importance of Guantánamo base as a strategic asset. I stand by my prediction: Obama will gift Guantánamo base to the Castros before his term is over. I have been predicting for quite a while that the Obama administration’s next goal regarding its foreign policy on Latin America is to gift the Guantanamo naval base to the Castro’s communist regime. Aside from further demonstrating weakness, relinquishing the base at GTMO would be a strategic misstep of epic proportions for the United States. It would have significant national security and military implications. GTMO is the oldest overseas U.S. naval base and only permanent U.S. defense base in the region. Its location enables U.S. forces to maintain full advantages across a wide spectrum of military operations. It plays a critical role in migrant operations assistance missions and is a logistics center for U.S. ships and aircraft, allowing these assets to maintain tactical advantages and freedom of movement in strategic waters in a region with limited U.S. military presence. 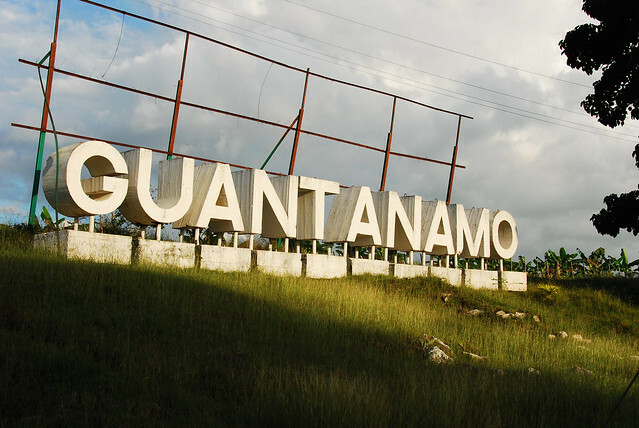 If Castro achieved control of GTMO, what would happen? The all-too-obvious answer is that it would allow him to extend an invitation to one of the close allies of Havana, such as the Putin regime in Moscow or the mullahs in Tehran. If any of the actors interested in taking over the lease of GTMO does move into the warm Cuban waters off Florida’s southern coast, this would provide a direct military threat to the U.S. homeland. Consider for a moment the depth of waters and potential ability for nuclear submarines to conduct intelligence operations or worse. Two years ago, the Russian Defense Minister stated that Russia wants to build military bases in several countries in the Western hemisphere, including Cuba. Press reports of Russian intelligence ships operating in the waters around Cuba, most recently earlier this year on the eve of U.S. talks with Cuba in Havana, prove that Russia is deadly serious about making good on those intentions. the list includes Vietnam, Cuba, Venezuela, Nicaragua, the Seychelles, Singapore and several other countries. “The talks are under way, and we are close to signing the relevant documents,” Shoigu told reporters in Moscow. The minister added that the negotiations cover not only military bases but also visits to ports in such countries on favorable conditions as well as the opening of refueling sites for Russian strategic bombers on patrol. Remember what Russia is doing in its own neighborhood for a moment. Vladimir Putin brazenly acted to annex the Crimean Peninsula, ignoring the international outrage, and Ukraine is worried about a “full-scale” Russian invasion. If the U.S. gave way on GTMO, Putin would likely welcome the opportunity to have warm-water lodging for his navy only 90 miles from the United States. Similarly, Iran continues to test the patience of the international community with its nuclear operations and refusal to cooperate with international inspectors. If things go badly for Iran with any nuclear deal, having a deeper presence in Latin America through Cuba offers Iran options for retributive action should they want it. Whether Iran gets what it wants on the nuclear deal (which it does) or not, by lifting sanctions, the U.S. has given Iran every incentive to continue its ongoing economic and political expansion into Latin America. You can expect that making a deal with the Castros on Gitmo is part of their plans. The administration readily caved on Iran’s nukes because it viewed the matter only as a timely pretense for achieving other cherished aims. These were: (1) preventing an Israeli attack on Iran; (2) transforming the United States into a more forgiving, less imposing power; (3) establishing diplomacy as a great American good in itself; (4) making Iran into a great regional power; and (5), ensuring the legacies of the president and secretary of state as men of vision and peace. Items 2-5 will play well with that Gitmo gift. 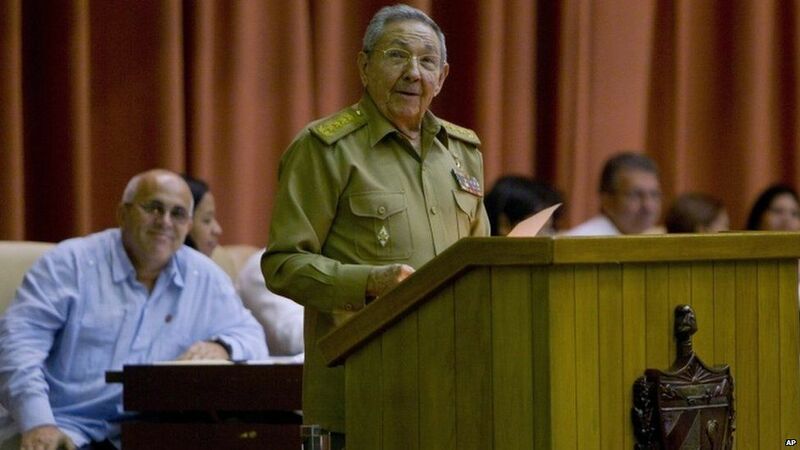 In a speech to the National Assembly, Mr Castro said that, for normal relations to resume, a US embargo on Cuba would have to be lifted. He also called for the US naval base at Guantanamo Bay to be returned to Cuba. The die is cast, now we just wait for it to roll. Six former prisoners in the Guantanamo detention center in Cuba were set to begin their lives as free men in Uruguay on Monday, as President José Mujica said they could travel in and out of the country. Under what country’s passports?, you would ask. Once they get (Uruguayan?) passports, where will they go? Most of the men—a Palestinian, four Syrians and a Tunisian—were likely to leave the hospital on Tuesday once they cleared extensive physical and mental tests and move into temporary housing, officials said. In a televised interview on Friday, Mr. Mujica—a former guerrilla who was imprisoned for 14 years—said that while he had long criticized the U.S. for its “interventions and abuses,” he couldn’t decline a request by Mr. Obama to accept the men.